Finally – Seaview Interior Photos! 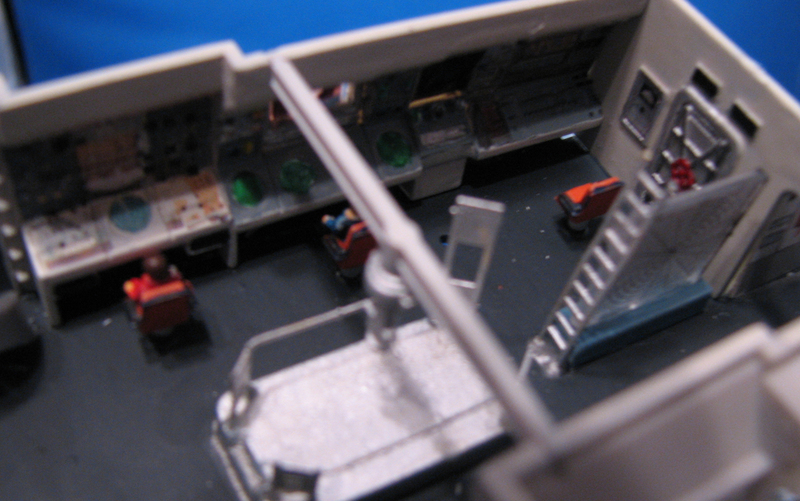 I’ve been working, on and off, since last June on the interior of the wonderful Moebius Models Seaview. (For those of you who don’t know, the Seaview is from Irwin Allen’s 1960s movie and TV series Voyage To The Bottom Of The Sea.) The kit is 1:128 scale, which means the model is huge – 39 inches long – and meticulously detailed. 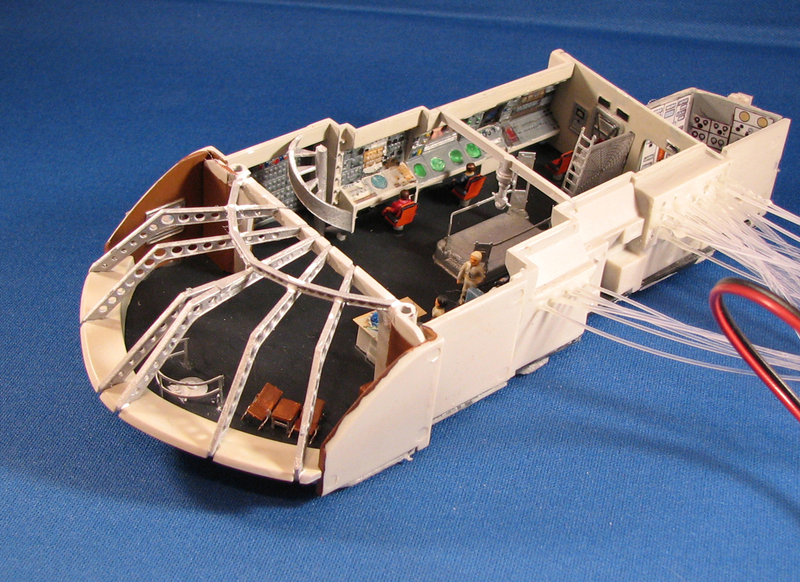 It includes an interior of the control room and the observation lounge since they can be easily seen through those four big windows on the nose. I wanted to do the interior justice within the limits of my modeling skills, so I’ve been working on it slowly but steadily. I used two great aftermarket sets – the photoetch, resin, electronics and decal set from Just An Illusion and the photoetch set from Paragrafix. I ended up using some of the decals and some paint, and used the kit’s side walls. JAI provides clear resin walls that can be masked and painted, but after trying that twice I was still unhappy with the results. My skills are not quite up to the task, as yet. The clear resin and the very thin decals make the radar screens and other illuminated areas light up well, but it’s hard to mask the other areas. I even scanned the decals and used my own set on Micro-mark decal paper, hoping they would be thicker and not allow so much light to bleed through, but it wasn’t enough. I figured I could live without the radar screens being illuminated. There are two video screens on the starboard wall. I drilled both of them out and used homemade decals applied to thin clear plastic sheet for the screens. One shows an underwater launch of a trident missile as it reaches the surface of the ocean. The second shows Arthur Schlesinger, Jr., who was a Secretary of Defense under Richard Nixon. The TV show was set in the mid-1970s, and the officers often talked to Washington higher-ups by video in the show; and since my son-in-law’s last name is Schlesinger (no relation) I thought he was a good choice. Once the control room is inside the hull I expect there will be enough light bleed-through to illuminate those two screens without LEDs. The aftermarket set includes a beautiful phototech ceiling mini-kit for the control room, and an electroluminescent panel to simulate fluorescent lighting in the ceiling. 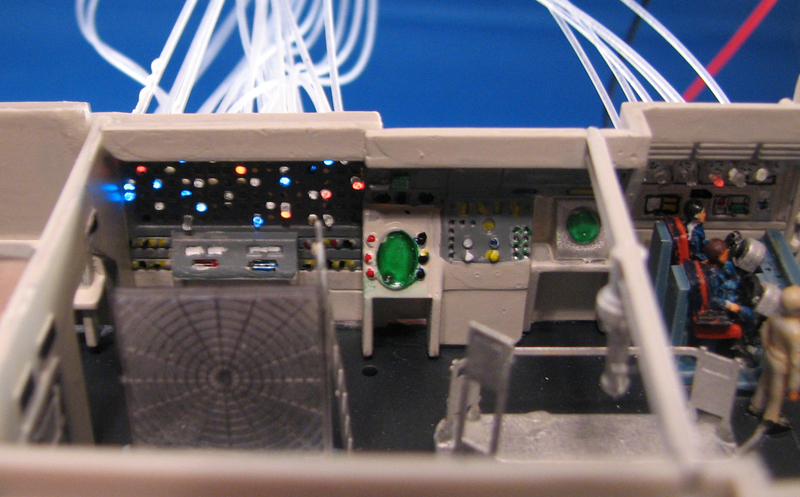 I also used fiber optics and a four-LED flashing light circuit board to simulate the computer’s flashing lights on the aft section of the control room, port side. I can’t recall where the circuit board came from. I’ve been collecting LED stuff like that for model lighting for a few years and I have two of these. The board is about an inch and a half square and the LEDs are mounted to the board. There is a pot on the board to control flash speed but that’s it – and the blue and red LEDs light at the same time, followed by the yellow and green ones. Still, I think they give some of the feel of the computer’s flashing lights while providing a little more color interest that just flashing yellow or white would have. 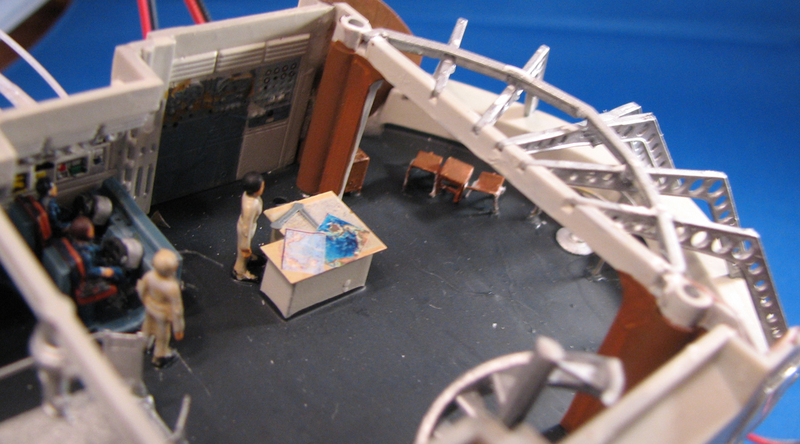 In this image you can even see – though it’s blurry – the credenza on the right side with a tiy model of the Seaview on it! They are from the photoetch set from Paragrafix. So are the lounge chairs and table in the observation lounge area. The set also includes a tiny dinner table and chairs, which I built and then decided not to include – that area isn’t that big and usually the table and chairs are only used for special occasions on the boat. 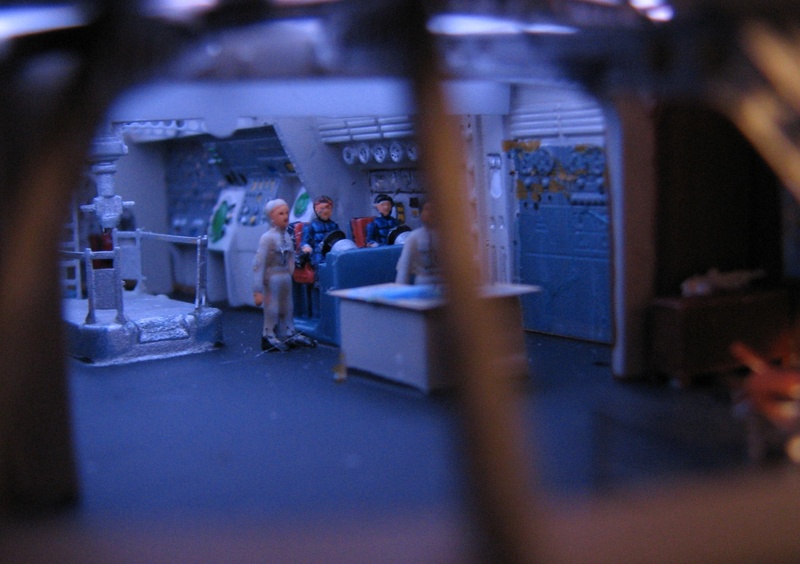 Paul also sells an aftermarket photoetch set for the interior of the Flying Sub that is included in the Seaview kit. 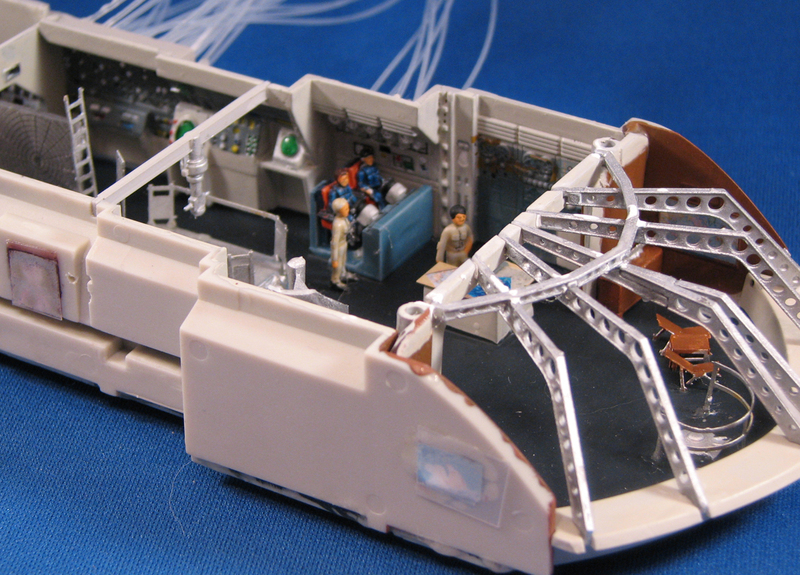 It’s gorgeous, it goes together easily and will be more than enough detail for a Flying Sub about five inches across! The Paragrafix set includes railings for the periscope island and even a replacement tabletop and drafting machine for the chart table. (The JAI set also includes an entire replacement chart table, top and drafting machine. It also includes chairs and such, but the photoetch sheet is thinner than the Paragrafix and I found the parts harder to foldin the JAI set, even with a folding device. ) There are charts on the table that are decals I made of a couple of maps, greatly reduced. One thing I’ve not seen on other folks’ builds – I watched most of the second season of VTBS, which is the reference for the model, and I never saw a railing on the spiral staircase. I cut it off. 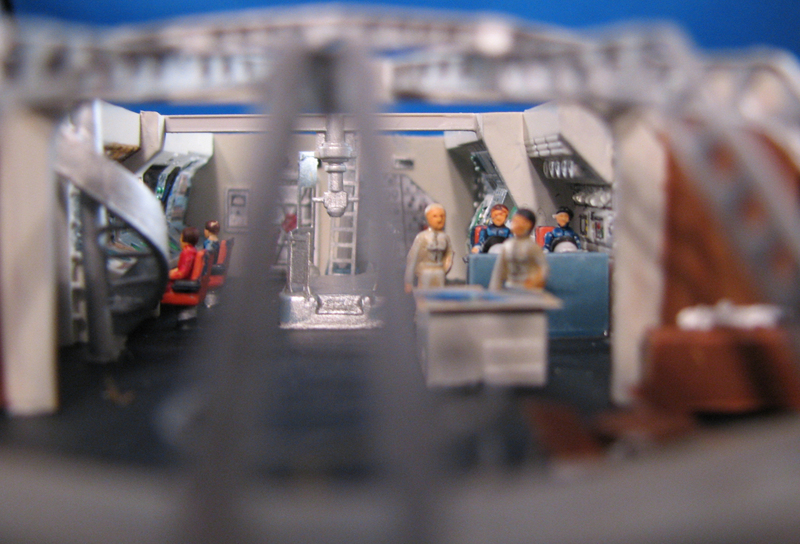 The support beams with the lightening holes in the observation lounge are the kit parts, which fit pretty well. Here you can see the fiber optics run from the LEDs to the holes drilled in the computer display. I hope they fit inside the hull! I glued the fiber optics directly to the LEDs with 5 minute expoxy, then I covered the connection with heat-shrink tubing. It doesn’t work so well because if I applied enough heat to fully shrink the tubing I would melt the plastic fiber optics – no glass fiber here! Here is the interior lit by the EL sheet through the rectangular holes in the ceiling. The rectangles simulate fluorescent tubes in recesses, covered by diffusers, and the effect is pretty good! The plastic figures are passable. Most of them are seated and I stole one of them to pilot the Flying Sub, painting Admiral Harriman Nelson’s (Richard Basehart) “sandy brown” hair on him and including a black leather jacket that was standard issue when crew flew in the FS. 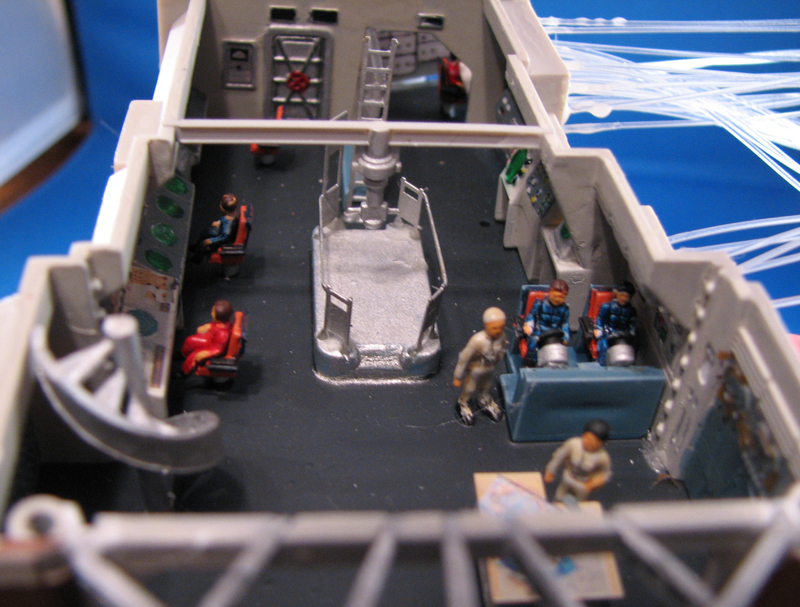 The two standing figures in the control room are painted to represent Captain Lee Crane (David Hedison) – black hair – and Lt. Commander “Chip” Morton (Bob Dowdell) – blond hair. As I begin to work on the exterior I will try to post some images. I’ve just started the Flying Sub bay, which attaches to the underside of the control room so the whole unit is inserted into the hull at once, with the forward bottom section of the hull. More later once I find a way to focus a little better. I also noticed some spots on the photos that will need paint cleanup that were hard to see in real life! You are currently browsing the The Old Gray Cat blog archives for the day Thursday, October 23rd, 2008.